What is Altitude Mountain Sickness? 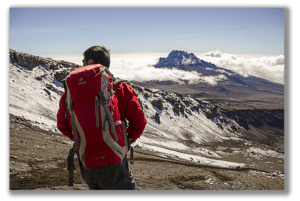 While a Kilimanjaro climb is generally a safe and rewarding adventure, there are always risks involved whenever you embark on a trek into the mountains. Probably the biggest challenge is the potential for developing altitude sickness – sometimes referred to as acute mountain sickness (AMS) – which comes about when the body is deprived of oxygen while traveling at high altitude. The symptoms of AMS can vary greatly in terms of severity and intensity, with each individual reacting differently to altitude. Common symptoms include headaches, fatigue, shortness of breath, and a rapid heart rate. More serious conditions can result in a persistent cough, a fever, loss of appetite, and an inability to sleep. When AMS gets even more serious yet, climbers can experience nausea, vomiting, loss of balance, dizziness, or even death. Most climbers experience at least a few of these symptoms while trekking on Kilimanjaro, particularly when they go above 2400 meters (7870 feet). In its mild state, altitude sickness is not particularly dangerous, but it can turn into something more serious if the symptoms persist and continue to grow worse. In most cases, the only cure for AMS is for the climber to descend to a lower altitude to rest and recover. There is no guaranteed way to completely avoid altitude sickness, but there are some things you can do to help reduce your chances of contracting AMS. For instance, you should stay hydrated while on the mountain, drinking a minimum of three liters of water each day. You should also hike at a slow pace and try not to push yourself too hard. If you need a break, stop along the trail and catch your breath. Going too fast and climbing too quickly can increase the likelihood of getting sick. Throughout the trek, we’ll also be adhering to the “climb high, sleep low” strategy, meaning we’ll hike up to higher altitudes throughout the day and then drop back down to lower elevations to camp. This allows your body to steadily acclimate to the thinner air, making it less likely to contract AMS and giving you a better chance of reaching the summit. Our guides have all received wilderness medical training and are dedicated to making sure you stay safe and healthy on Mount Kilimanjaro. They know how to spot the early signs of altitude sickness and can help treat the symptoms before they get too serious. If you are feeling ill or think you may have AMS at any time during your climb, alert one of the guides as soon as possible. We also conduct daily medical checks to ensure that our clients are as comfortable and happy as possible. Our goal is to get you to the summit without compromising your safety in any way.